The play "Igagoe Dôchû Sugoroku" was originally written for the puppet theater (Bunraku) and staged for the first time in the 4th lunar month of 1783 in Ôsaka at the Takemotoza. It was adapted for Kabuki the same year and staged for the first time in the 9th lunar month of 1783 in Ôsaka at the Naka no Shibai [casting]. "Igagoe Dôchû Sugoroku" was made up of 10 acts. "Engakuji" was the third act. In order to induce Sawai Matagorô to surrender himself, Lord Uesugi holds Matagorô's mother Narumi in hostage. Matagorô confines himself to the Engakuji Temple in Kamakura and is protected by his cousin Sawai Jôgorô and several other vassals of the Shôgun who are antagonistic to Lord Uesugi. Jôgorô has asked Matagorô to steal the Masamune sword from Wada Yukie because, if it had remained in Yukie's possession, Lord Uesugi would certainly have taken it from him and presented it to the Shôgun so as to make him more powerful in the shogunate government. Jôgorô has sent a letter to Sasaki Tan'emon, the emissary (shisha) of Lord Uesugi, proposing to make Matagorô surrender himself if his mother (and Jôgorô's aunt) Narumi is released and the Masamune sword is given to him. Tan'emon has agreed to comply with Jôgorô's request. Jôgorô is planning to recover Matagorô by force soon after he is carried away by Tan'emon and his men. In fact he has even made an arrangement to make Matagorô escape to Sagara in Kyûshû with the help of Gofukuya Jûbê, a draper, who is expected to act as his guide. Jôgorô calls Jûbê, and hands to him a seal box containing a miraculous medicine which can cure a wound. The medicine is to be used in case Matagorô is attacked and wounded during his trip. Jôgorô turns over Matagorô to Tan'emon in exchange for the sword and the release of Narumi. Narumi, who is ashamed of his son's outrageous behavior, deeply self-arms with the Masamune sword, wishing to commit suicide as a substitute for Matagorô and hoping her son should not be handed over. Jôgorô's men soon recovers Matagorô by attacking Tan'emon and his men. Tan'emon is seriously wounded. Meanwhile, the evil Matagorô successfully flees from the precincts of the Engakuji Temple. Wada Shizuma and his retainer Ikezoe Magohachi arrive at the temple to help Tan'emon but Shizuma too is wounded by Jôgorô's retainers. Out of despair Shizuma attempts to commit suicide but is dissuaded by Tan'emon, who encourages him, saying that the precious sword was not in fact taken away. It was a false Masamune sword that Tan'emon handed to Jôgorô. 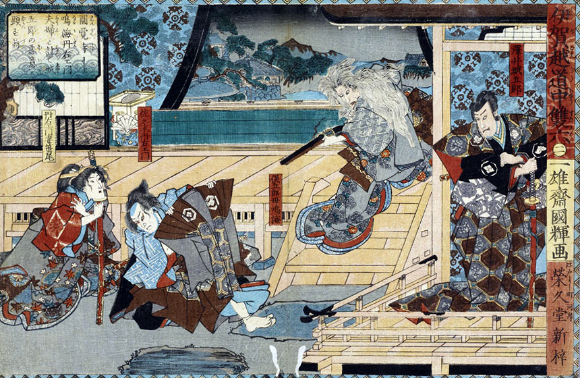 Taking the precious sword from the palanquin (kago) in which he has concealed it, Tan'emon hands it to Shizuma, advising him to avenge the death of his father with the help of his brother-in-law, Karaki Masaemon. Tan'emon and Narumi die together, giving the coup de grâce to each other.